As America’s trusted brand for 65 years, Dial® continues to deliver clean, healthy skin for you and your family. And as thanks for being a loyal fan, we are now giving away the ultimate Grand Prize - $65K in Gold! To commemorate the Dial brand's 65th anniversary Dial is giving away $65,000 in GOLD to one Luck winner! 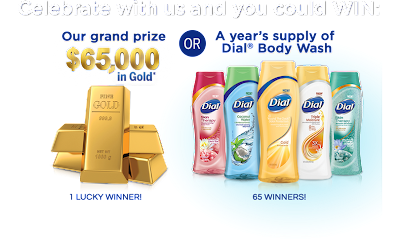 Whats more, everyday from June 16th to August 19th 65 daily winners will receive a year's supply of Dial Body Wash. Participants may enter once a day at Facebook.com/Dial to increase their chances of winning as well as share the sweepstakes through social media sites to receive an exclusive Dial coupon. To help celebrate the 65th anniversary 3 readers of Dnbuster's Place will win a coupon for a FREE bottle of any Dial Body wash. To enter to win please use the rafflecopter form below. My giveaway will end July11th! disclosure~ Purex provided me with dial coupons in exchange for sharing the Dial sweepstakes. I really like the Dial Antioxidant Body Wash with Cranberry and Antioxidant Pearls! I like all the Dial body washes, as well as the new Kids Shampoo and Body Wash! I like the body washes!! I would love to win..I love body washes better than bar soap. Easy on the sensitive skin. I love the lavender scented body wash.
My favorite Dial product is the kids body wash/ shampoo combo. My favorite Dial product is their Coconut Water Body Wash. I just love the way it smells! It leaves my skin so soft and refreshed! I haven't tried the body wash but would love to...that's why I am entering! I haven't tried the body wash or foaming hand wash yet so my favorite is the original hand soap.